Accuweigh , a leading Australian provider of specialised industrial weighing solutions recently commissioned a truck weighbridge for a seed cleaning business in South Australia. Accuweigh’s Port Adelaide branch managed the installation at the customer’s site. The truck weighbridge measuring 8m x 3.5m is used for weighing truckloads of grain entering and leaving the operation based in SA’s York Peninsula. 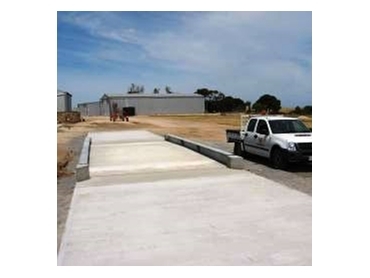 Since extensive land was available for the weighbridge installation, an aboveground design was used to minimise foundation costs for the client. At each end of the truck weighbridge, 9m long level approaches were fitted to facilitate legal weighing of tipper trucks with dog trailers. The concrete deck weighbridge is fitted with 4 x Flintec RC3 30T weighbridge load cells, which are connected to a Rinstrum 5000 digital weight indicator. A weighbridge hut contains a PC running AASoftware’s weighbridge software for tracking all incoming and outgoing grain deliveries. Accuweigh has branches in all mainland states providing complete after sales service and support for truck weighbridges.